We have been twittering and commenting on the chow and chatter facebook page and blogger for age's. She inspired me with this recipe for the first time I made gnocchi and I have been waiting for a picture to share with you all! She actually made it with Orrechiette which I had to Google, they are a special ear shaped pasta from Northern Italy, she also added some crushed tomato, like I would do per Lisa! It is with great pleasure that I submit my recipe for Pasta with Broccoli Rabe. My original recipe was just fine as it was, humming along nicely, with no changes over the years; however, Rebecca made her own version and I blatantly lifted the idea of adding tomatoes to my dish and voila! a much better version was born. So, in the picture, you will see some lovely tomato along with the sausage and broccoli rabe and I am very pleased with the new, updated version. I hope you all enjoy it as much as I do, and a big thank you to my blogging buddy, Rebecca, for letting me play a little in her world. Clean and chop one pound of broccoli rabe into bite-sized pieces. Steam until tender and set aside. Saute four finely chopped cloves of garlic in about 2 tbsp really good extra virgin olive oil. To that add 1/2lb crumbled raw hot (or sweet) Italian sausage (just squeeze out from the casing). I really like turkey sausage for this but pork is fine, too. Break up into small pieces and cook until no longer pink. Add the broccoli rabe and cook for another 5 minutes or so, to really blend the flavors. Toss with freshly cooked Orrechiette or gnocchii and top with grated parmagiano or pecorino romano cheese. Depending on the sausage, you may need to add an additional tbsp or more of olive oil to the pan to make a nice, slippery consistency to coat the pasta. I can get by with an additional tbsp and have been able to toss this with a full pound of pasta, no problem. As that serves 8 people, I don't think the additional oil poses any problem as 1) it's the really good stuff, and 2) half a tbsp or so per person is not at all a bad thing. Has anyone else heard of this pasta it looks so cool, I am on the look out for it! delicious! I make something really similar with sausage and broccoli rabe, but I toss it with gnocchi. It's one of Shawn's favorite dishes. Ohhh, and I always make this with farfalle. It's a quick stand=by on weeknights. A fave! Love it. Looks really good... I just love pasta. This is something that I would really love to try. Although I don't know where I could get this type of pasta. I love pasta, but have to eat it in small portions and not as much as I would love, and this looks and sounds great! hey i just LOVE ur blog....and i have an award waiting for you..do visit my blog to collect it.. This is my FAVORITE way to have broccoli rabe. Which, coincidentally, is one of my favorite veggies! Definitely a winner recipe, I can vouch for that. i love orecchiette! 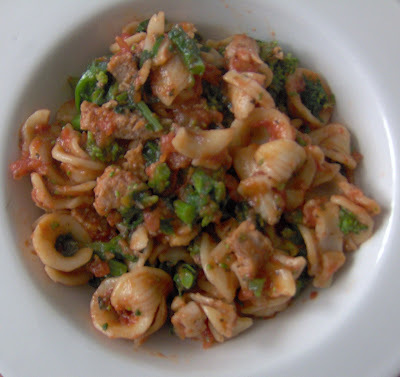 my husband is from apulia where the orecchiette were inveted! he loves them too so i prepare the very often! thank you for sharing the recipe and wish you a lovely and sweet day! Looks delicious...I am always ready for a good pasta dish and this looks like a great one! Wow, I'm so humbled by all your lovely comments. De Cecco, Barilla, and Anna pasta all make the orechiette shape; the De Cecco is my favorite as it has the best texture, but all three work very well and taste fantastic. Yumm that looks delicious, love pasta dishes, although have never tried orrechiette :). Delicious recipe, Rebecca! And really very easy to make too! I actually have some orrechiette in my pantry. And I love broccoli rabe! Justyna- wow you are from there, that is so so cool, maybe you can do a post for us! its the second time I've heard of this pasta and it is cool but I've never seen it here. Oh my, pasta with sausage is just awesome! I love it!! This dish looks absolutely scumptious Rebecca! Lol... one of my daughters has small ears and we lovingly call her orrechiette! Pasta with broccoli and Italian sausage or chicken is a stand by at our house. I have made something like this but it isn't as delicious as what you said in your blog. And now I'm depressed. This looks so very delicious! All of my favorites wrapped into one! I love this. I recently made a sausage escarole pasta dish and was originally going to use broccoli rabe, but my store didn't have it. I would love to try the rabe.